Jockey Jorge Torres pilots Ivoriona to the top qualifying time in the $239,400 Grade 1 Speedhorse Graham Paint & Appaloosa Futurity. OKLAHOMA CITY, OK�MAY 21, 2016�The final set of trials for the 2016 Remington Park American Quarter Horse Season were conducted on Saturday. Ivoriona impressed in her second career start and easily owned the top time for the Grade 1 Speedhorse Graham Paint & Appaloosa Futurity. 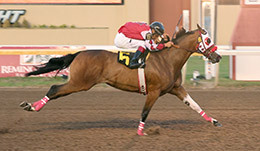 The richest futurity race for Paints and Appaloosas in the world at $239,400, the Speedhorse Graham final is part of the June 4 �Mega-Card� of stakes races on the final night of the Remington Park season. Ivoriona laid her claim for a large portion of that purse, covering the 350-yard trial distance in :17.696 seconds over a fast track. Lightly tapped three times by jockey Jorge Torres, Ivoriona appeared to have plenty left as she finished two lengths ahead of Ho Lotta Love. Owned by the Lexington, Okla. partnership of Mickey Johnson and Randy Hill, Ivoriona is trained by Stacy Charette-Hill. A talented 2-year-old Paint filly by IVORY JAMES (QH) from the Texas Hero mare Friona, Ivoriona was bred in Oklahoma by Johnson. Ivoriona is a perfect two-for-two in her early career and is set for her biggest payday yet if she competes in the Speedhorse Graham final like she has in her two attempts. She broke the Remington Park Paint/Appaloosa track record in her career debut at 250 yards in March, two months before her sharp trial run. For the 10 finalists for the Speedhorse Graham Futurity, with individual times, sires, dams, owners, breeders, trainers and jockeys CLICK HERE. The lone Appaloosa in this year�s Speedhorse Graham Futurity is Col Bucks. The Speedhorse Graham Futurity is the first in the Speedhorse Triple Crown series of futurities. The Speedhorse Fair Meadows Futurity in Tulsa, Okla. in July is the second leg. The third and final leg is the Speedhorse Lone Star Park Futurity in Grand Prairie, Texas in October. The Speedhorse Triple Crown was won for the first time in 2015 by Painted Turnpike.